I recall reading about this some twenty years or so back. Now, thanks to the magic of the internet, I have been able to find it again. What is interesting is that a Prince Philippe of Araucania still claims to be the head of the Royal House. He lives in France. Now I wonder if one can consider Prince Philippe a legitimate claimant to a real throne. I am not in a position to verify the facts about what happened in the 1860s, but assuming the version given is true, then it would seem that the native chiefs had sovereign authority, and could acclaim a king. Of course, no European ideas about ‘legitimacy’ would have existed amongst the Araucanian peoples. King Zog of Albania reigned for quite a short time, and was not of royal birth. Indeed, having been president, he was elected king by the Albanian Parliament. Still, his son King Leka seems to have no trouble claiming the throne, so neither of those factors would seem to matter much. Possibly it matters more that Philippe is not a descendent of King Orelie-Antoine I, or even of his family. Orelie-Antoine did not marry, and according to the account given on Prince Philippe’s website he nominated his successor, who similarly nominated another unrelated person to succeed him. This all seems very odd. Now I would not in general be troubled with the senior descendent of a king, no matter how short lived his reign, claiming some princely title. But for someone completely unrelated to do so seems wrong. And the present Prince has no children, so the claim will presumably pass elsewhere. It would not matter from a purely legitimist point of view, if the succession to a real throne was certain, but I think it interesting that Prince Philippe’s nobles, etc, all seem to be French. The Kingdom seems to have only the most tenuous connection with the people Orelie-Antoine was trying to liberate. Can a king exist apart from a kingdom (in the sense not of a territory, but of a people)? This is a fringe sort of matter in many ways, but such cases are useful in trying to establish general principles. The Imperial Purple descending to a 'selected' heir (albeit by adoption) from the 'grandest century' of the Roman Empire. Thus the 'descent by nomination' has precedent. Titles in Pretense have of course, long been held with no real association with the people and lands in question, so that might be a more direct link to pursue. Prince Philippe has been the head of the Royal House of Araucania for nearly 60 years and he has done a fine job -- slow, steady, dignified, above reproach. He is now 83 years old and continues to press ahead with the claims of the Mapuche people regarding their sovereignty. The important issue with the Kingdom of Araucania and Patagonia is not so much that it is an historical oddity, but rather that it was one more example of the Mapuche people exercising their sovereignty. The persistence of the Royal House is important to the persistence of their agitation for greater autonomy and self-determination within the Republics of Chile and Argentina. No one within the Royal House has any illusions about a restoration, but they remain committed to the principle and cause of self-determination -- a self-determination which in 1860 elected Orelie-Antoine de Tounens as King of Araucania. By the way, the North American Araucanian Royalist Society is hosting their annual King Orelie-Antoine Memorial Dinner in Philadelphia this year -- this being the 150th anniversary of the founding of the kingdom. That's happening November 13, 2010. Just a note that the North American Araucanian Royalist Society has relaunched its website, which can be found at http://www.steelcrown.org. Those who are interested in obtaining a copy of The Steel Crown, the official journal of the NAARS, can visit the website and ask for a complimentary copy. I visited the museum of Kings de Patagonie in Chourgnac (it is installed in the native house of king Orélie-Antoine) and I also met prince Philippe. A few kilometres from there, you can also see the tombs of Orélie-Antoine 1st and of his successor Achille 1st. In addition, the monarchist writer Jean Raspail animates a " regence" of Patagonie which is rather known in France. 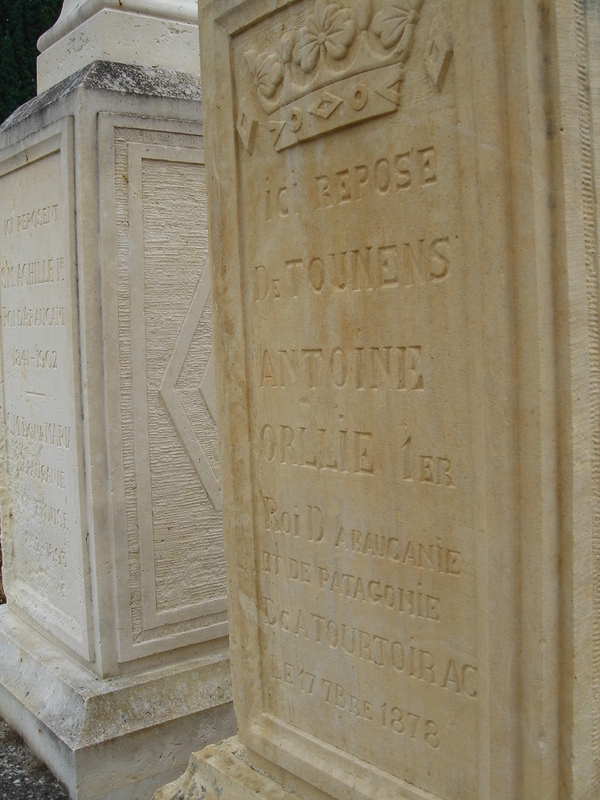 -Tombs of kings Orélie-Antoine and of his successor Achille. This was in 1998. The Patagonian natives, who were largely exterminated by the present inhabitants of the country, are unlikely to have ever been aware of the existence of the Falkland Islands. People seem to think that you can see these with a good telescope from the Argentine mainland. You cannot, they are three hundred miles away. Their only period of continuous settlement has been under British rule, the present (British) inhabitants are the only native population the islands have ever had, and Argentina and Argentines should be ashamed of the blood spilled in its attempt to forcibly and without a shred of right seize the sovereign territory of a friendly nation, trampling over the wishes and right to self-determination of the inhabitants of that territory. Not continually revive the memory of it with foolish stunts such as this; it was as I say 12 years ago, but Argentina has by no means shut up since on the question. It ought to. The North American Araucanian Royalist Society had a wonderful celebration of the sesquicentennial of the founding of the Kingdom of Araucania and Patagonia a week ago today -- 11/13/10. We packed out the Franklin Inn Club in Philadelphia. The Philadelphia Inquirer published a rather nice article on the event. I'd post the link, but there seems to be some technical impediment on this blog. But, if you are interested, you can go to http://www.philly.com and search "araucania" and Daniel Rubin's article will come up. I've also posted a link to The Inquirer on the official site of the NAARS -- http://www.steelcrown.org. On November 17, 1860, over 3000 Mapuche representatives assembled at the foot of the Andencul hill in the community of Lonko (Chief) Kilapan. This constituent assembly (Futa Kollog), which included the nation’s most celebrated political, military and spiritual leaders, came together with the intention of establishing a constitutional and hereditary monarchy in the Mapuche territories of Araucania and Patagonia, now collectively referred to as Wallmapu. This aspiration was duly realised when King Orélie Antoine de Tounens was inaugurated as the Kingdom of Araucania and Patagonia’s first monarch. After its constitutional monarchy had been formally established, the Mapuche nation sought international support and recognition. According to several researchers, Great Britain, Italy, France, Peru, Bolivia and Paraguay appear to have formally recognised the Kingdom’s independence (Brazil and Persia evidenced de facto recognition). Prince Philippe I heads the Royal House of Araucanía and Patagonia and assumes responsibility for the maintenance of its institutions. He sustains the profile of the monarchy-in-exile by conducting interviews, participating in international forums and public engagements. He simultaneously oversees commemorative ceremonies and authorises the issue of stamps, medals and the minting of coins. On rare occasions he confers titles, Royal Orders, decorations and honours upon those who have distinguished themselves in the service of the Kingdom and the Mapuche people. Just to tag onto this good conversation, a new Prince of Araucania was elected and inaugurated on March 24, 2018, in Paris, France. His name is Prince Frederic Luz I of Aracuania and he succeeds Prince Antoine IV, who died unexpectedly on December 16, 2017. Prince Frederic was born in Toulouse, France, in 1964. He previously served as the Judge of Arms of the Royal House of Araucania. He is married and has two children. 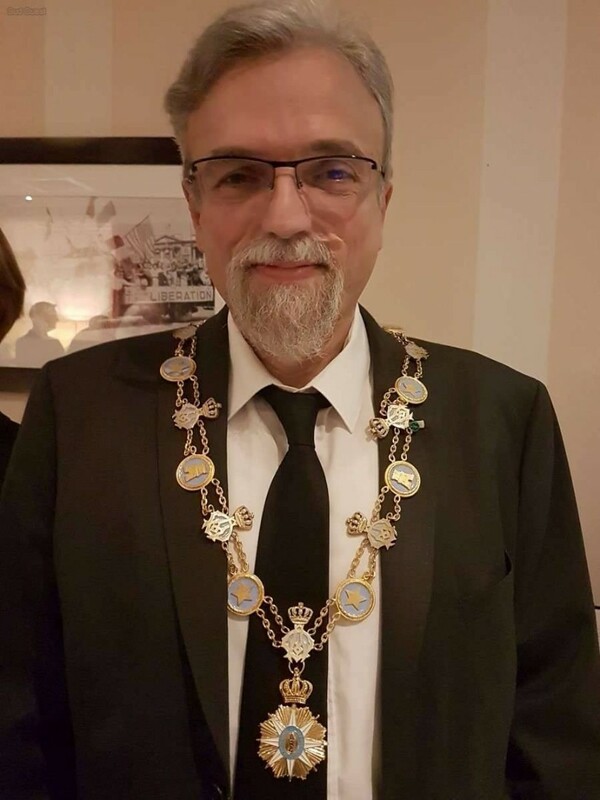 Here's a picture of the new prince on the evening of his inauguration, wearing the Grand Collar of the Royal Order of the Star of the South.